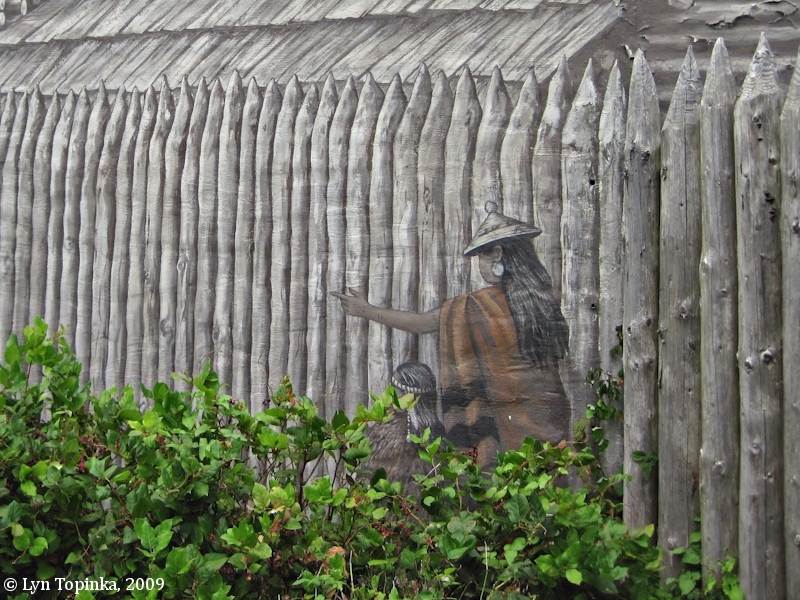 "Mural ... Fort Astoria, Astoria, Oregon"
Click image to enlarge Fort Astoria replica, blockhouse and mural, Astoria, Oregon. Image taken August 8, 2009. 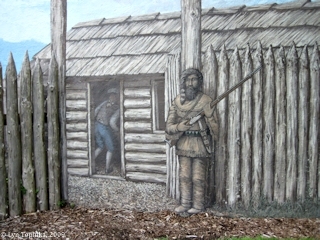 In 1956 a replica Fort Astoria's blockhouse was constructed on the site of the early fort. 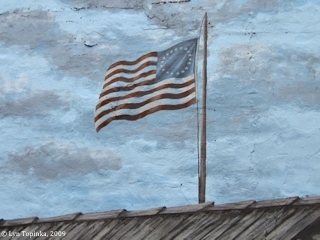 Since 1956 three murals depicting the fort of 1813 have been painted on the side of a building at the site of the blockhouse. 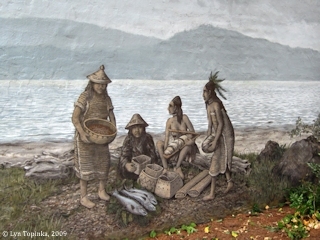 The first mural was done by Arvid Wuonola. 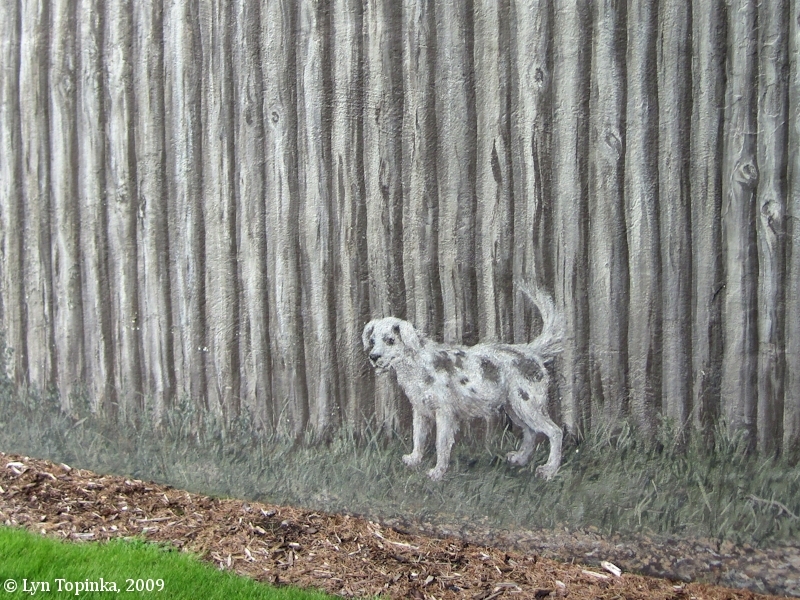 The second mural was removed in late 1980s when the wall was repaired. The last mural, painted in 2003 by local artists Roger McKay and Sally Lackaff, extends 100 feet around the 1956 recreation of the Fort's blockhouse. 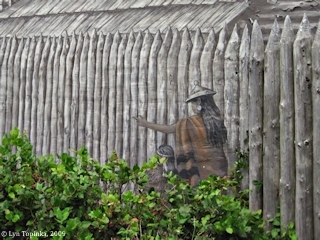 Click image to enlarge Mural, Fort Astoria replica, Astoria, Oregon. Image taken August 8, 2009. Click image to enlarge Penny Postcard: Fort Astoria, ca.1960s. Penny Postcard, ca.1960s, "Fort Astoria, Astoria, Oregon". Caption on back reads: "This famous fort was restored in 1956. A "must" for the visitor to this area." Image by Henry Lonberg. 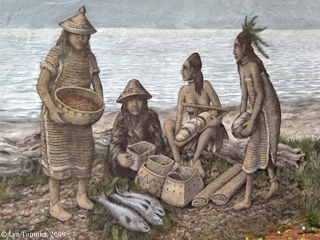 Distributed and Published by Smith's Scenic Views, Tacoma, Washington. In the private collection of Lyn Topinka. 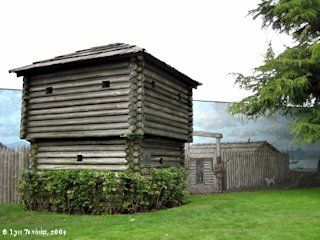 "FORT ASTORIA Desiring to dominate the areas explored by Lewis and Clark, John Jacob Astor sent expeditions overland and by sea to seize the mouth of the Columbia. 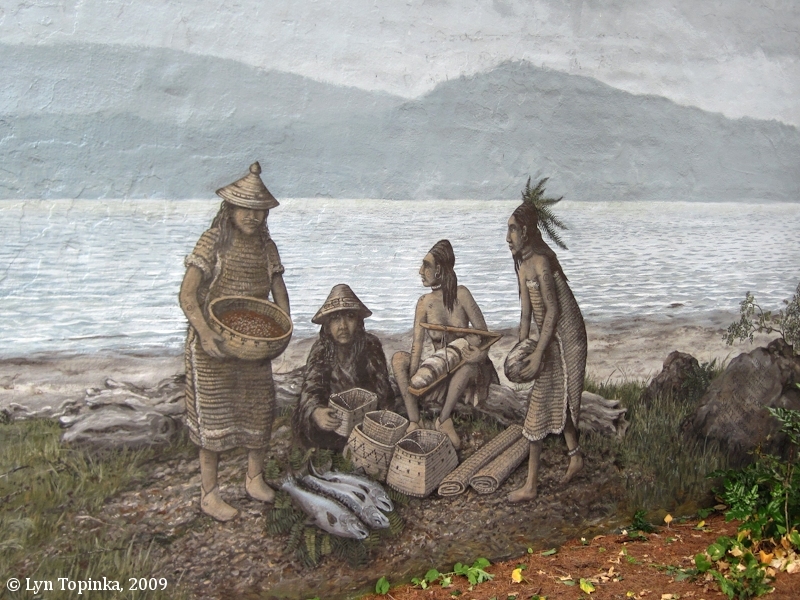 The schooner Tonquin arrived first and work was begun at this site April 12, 1811. 'The foliage was budding. We imagined ourselves in the garden of Eden. 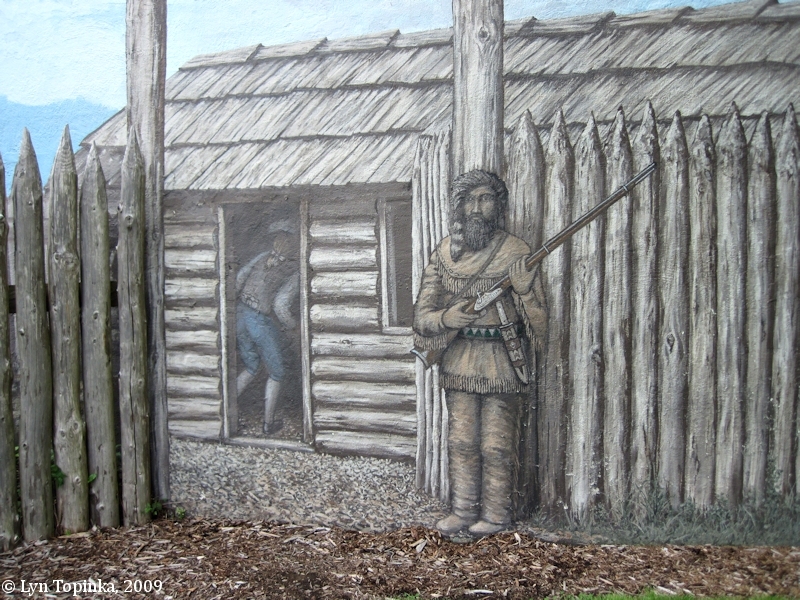 Buildings were of boards tightly covered and roofed with cedar bark.' Later palisades were raised against the Indians. Here gathered adventurers from all the vast wilderness. Here, in 1814, lived the Oregon country's first white woman, the English barmaid, Jane Barnes. Here were the true beginnings of our stock raising, farming, and shipbuilding. 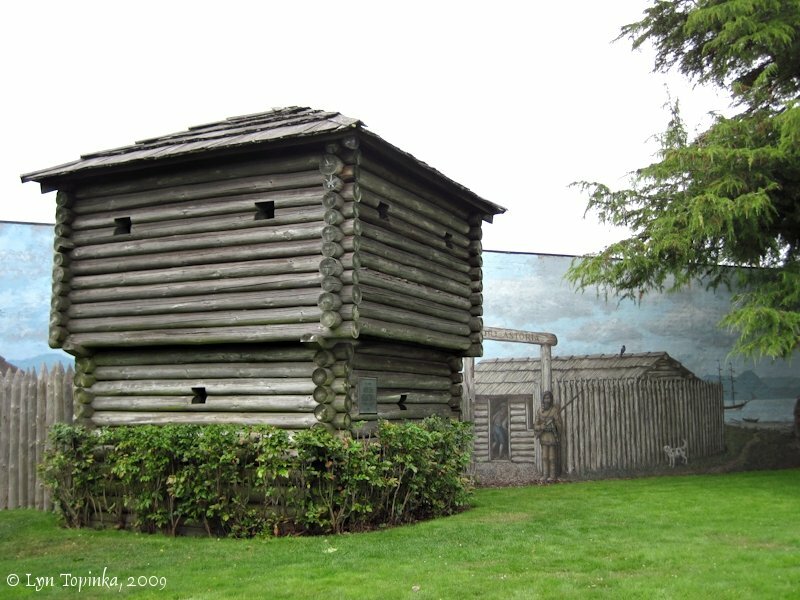 The property was sold to the North West Company to avoid capture during the War of 1812 and was operated as 'Fort George' until its abandonment in 1825 when the Hudson's Bay Company moved headquarters to Fort Vancouver. The buildings decayed and modern Astoria rose upon the site."